Manasa is the goddess of Naga and productiveness who accomplish the wishes and defend one against snakebite. Goddess Manasa was the daughter of sage Kasyapa and Kadru, the sister of serpent-king Sesha. The word 'Mansa' is stand for wishes and hence she also known as the Goddess rewarding the wishes of to devotees visiting the temple. The Devotees visiting temple and tie threads on a sacred tree near the temple looking for blessings of the Goddess for achievement of their wishes. Devotees return to untie a thread from the same tree once their wishes are fulfilled. The legend behind this goddess is that she requested her father, Lord Shiva, to incorporate her in the pantheon, so that she is worshipped by humans. Shiva takes action to it and says that, if Chand (of Anga kingdom) agrees to worship her, then her wish would be rewarded. After many deadly trials, Chand finally agreed to worship her with his left hand. 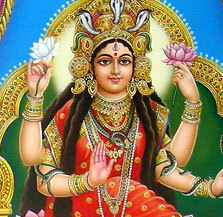 Only Manasa is the Hindu goddess who is worshiped till date by the left hand. Manasa is ritually worshiped with sacrifices accessible to her through rainy season, since, the snakes are most active in this season. Occasionally, she is believed to be a pre-Aryan goddess.